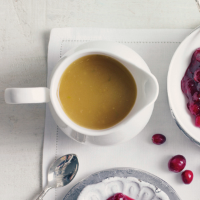 Recipe taken from the Waitrose Cookery School 'Classic Christmas dinner' course. 1. Fry the giblets in the oil in a large pan for 2–3 minutes, or until well coloured. 2. Add the vegetables, bay leaves, thyme, parsley and peppercorns, fry until well coloured, then pour in 1.5 litres cold water. Slowly bring to the boil, then cover and simmer for 30 minutes. As the water begins to bubble, skim off any scum with a slotted spoon. 3. Remove the lid and simmer for a further 30 minutes, or until reduced by half. 4. Remove the stock from the heat and strain through a sieve. 5. Leave to cool, then cover and refrigerate overnight.